Should you be an entrepreneur and start your own practice or should you be hospital (or group) employed? For some physicians, the answer is crystal clear – you want to start your own practice. The process of starting a practice is quite extensive and should begin before a physician finishes his/her residency or before the decision to leave a hospital or another group is made. As driven as you may be to get your practice up and running, if you don’t have a minimum of 6 months to devote to starting your new practice, you take the risk of having to see patients gratis if you intend on participating with third party payors. Should you set up an individual NPI, referred to as Type 1? Do you need to set up a group NPI, referred to as Type 2? Will you need a DEA certificate for the type of care you are providing? Do you know how to setup your Master Fee Schedule? Do you know how much to bill for each rendered service? Do you know which claim forms to use? Do you know how to maximize any “lesser of billed charges” verbiage that may be in your contracts? Do you understand the difference between a billed amount and an allowed amount? Do you know how to appropriately code to meet CMS expectations and prevent yourself from being audited? Do you understand the appropriate use of modifiers? Do you know how to appropriately verify insurance benefits and collect a copay, co-insurance and deductible from a patient? Do you know how to post payments in compliance with CMS mandates? Do you know how to appropriately issue a refund to a patient in compliance with CMS? Do you know the top insurance payors in your area and for your specialty? Do you know how to contract with each plan and understand the intricacies of what they each require? Do you understand how to complete an application for all payors you will be contracting with? Do you know how to interpret the language in payor contracts? Do you know that once you are credentialed with the payor you will then need to complete the contracting phase with the payor to obtain reimbursement for services rendered? Do you understand that you shouldn’t see patients until you have been effectively enrolled and contracted with the insurance plans? Did you know that practice management and medical billing software can streamline your entire collections process by tracking past due bills, identifying those patients who have fallen behind, and automating late fees? Do you know which system is the best fit for your practice? Do you know if there are specialized systems that cater to your specialty? Do you know how long the process takes to onboard a new system? Do you know which billing companies to contact or how much they charge? 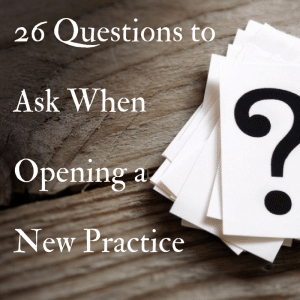 The ins and outs of starting a new practice are quite extensive. One of the biggest hurdles is getting credentialed as each payor has their own idiosyncrasies that can make enrollment a time consuming and costly process. I would suggest consulting with a professional to avoid lost time and lost revenue. When speaking with a credentialing company be sure to ask for references. Also, ensure your contract with the company is thorough and provides a remedy if work is not completed timely or the work does not meet expectations. In addition, be sure you have realistic expectations regarding timelines as the credentialing and contracting processes can take 3-6 months. Time is money and in the credentialing world every day counts! Cynthia Young is the CEO of STAT MedCare Solutions, which is a national billing, credentialing and practice management consultant. STAT is a U.S.-based, national provider of credentialing, payor enrollment, rate negotiation, and other credentialing related services.